Eligibility criteria for CDSE II exam? i want to know who r eligible for cdse 2 ? Job after BCA graduation from University of Burdwan with 65%? Details about government job being in 6th semester after completing B.E? Job in Indian Air Force after BBA completion? ECE jobs in Indian Army after B.E? Can i get the job of good salary in Indian Navy on the intermediate qualification? Can i join in Army being a women with 56% in diploma? Job in Army for Computer students after completing B.Tech with an aggregate of 75%? What are the eligibility criteria for B.Ed Exam? Re: Eligibility criteria for CDSE II exam? This is conducted by the Union Public Service Commission examination and recently this is inviting the applications for requiting the various posts like;. Indian Military Academy and Officer's Training and Naval Academy and Air Force Academy in combined defense service II. For this the notification released on June 2, 2012 and submission last date on August 27, 2012 and exam will be conducted on September 16, 2012. For Indian military academy and officer's training academy you must completed the graduation form recognized university or equivalent. For naval academy you must completed the B.Sc (with physics & mathematics) or bachelor of engineering from recognized university..
For air force academy you must completed the graduation form recognized university or equivalent(with physics & mathematics at 10+2 level) or bachelor of engineering. For naval academy you must be unmarried male candidates and age limit is not earlier than 2nd January, 1991. For air force academy you must be unmarried male candidates and age limit is not earlier than 2nd January, 1990 and not later than 1st January 1994 only are eligible. For this the selection processor is based on the written test and personal interview,and for this the application form will be available at http://www.upsc.gov.in. by paying the application fee 100 for general category candidates and OBC candidates and NO FEE for remaining candidates . C.D.S Stands for Combined Defence Service Examination is conducted by Union Public Service Commission twice in a year. Age should be between 19 years and 24 years and only unmarried male candidates are eligible. Graduation in any desire subject from any recognized university or equivalent qualification. Candidates who are appearing in the final year of degree course can also apply for this examination. The candidate age should be between 19 years and 22 years and only unmarried male candidates are eligible. Graduation in engineering from any recognized university or equivalent qualification. The candidates should have a 19 years to 23 years and only unmarried male candidates are eligible. Graduate or Engineering degree from any recognized university or equivalent qualification with Physics and Mathematics in 12th level. The age should be between 19 years and 25 years and only unmarried male or only unmarried females candidates are eligible. The candidate should have a graduate degree from any recognized university or equivalent qualification. CDSE stands for Combined Defence Service Examination and is a entry in all three wings of defence,altogether. Now the CDSE have entry in IMA(Indian Military Academy)-a entry in army. The educational qualification is graduation from any stream. Age limit is 19 to 24 years(at the time of commencement of the course,not at the time of applying). OTA(Officers Training Academy)-a entry in army. The educational qualification required is graduation from any stream. Age limit is 19 to 25 years(at the time of commencement of the course,not at the time of applying). AFA-Air Force Academy-a entry in air force. The educational qualification required is graduation from any stream but with physics and maths in 10+2. Age limit is 19 to 23 years(at the time of commencement of the course,not at the time of applying). NA(Naval Academy)- a entry in navy. The educational qualification required is B.Sc(Physics and maths) OR B.TECH. Age limit is 19 to 22 years(at the time of commencement of the course,not at the time of applying). The notification of CDSE is released in the month of May/June and October/November. For more details,visit the website of UPSC. A old notification of CDSE have been uploaded for your reference. CDS Stands to get Blended Defense Support this also Test is accomplished simply by Unification Open public Support Percentage.This specific Test is usually placed each double each year. With regard to Armed service along with Specialist Education Academy :- The actual Applicant should total Bachelors diploma (or) Comparative Test in different willpower accepted College. With regard to Fast along with Airforce Academy :- The actual Applicant should total bachelors diploma with Science ( for instance:- B.sc ) / Anatomist Study course out of accepted College. Note :- You cannot find any Minimal Portion of marks require with this Test. With regard to Airforce :- The actual Applicant grow older probably should not less and then 19 ages so that you can 23 Years . Marriage Status :- Simply Single male / Individual individuals are eligible to obtain ( Airforce Academy / Fast / along with Armed service academia ).Woman's along with Wed male individuals usually are not able to obtain that Aacademy. Note :- Both Male along with Woman's individuals are eligible to obtain Specialist Education academia. Nationality :- Yous need to be Person of Indian. Actual Common :- You need to be Literally in addition clinically in shape to get the CDS Examination. In case you match the qualifications Standards then this able to obtain this CDS Examination. The actual individuals should have a 19 ages so that you can 23 many solely unmarried male individuals are generally eligible. Masteral or perhaps Anatomist diploma in the accepted college or perhaps equivalent degree by using Physics along with Math concepts with twelfth level. Individuals who are appearing with the last yr of diploma program can also utilize with this examination. Age need to be between 19 many 25 many solely unmarried male or perhaps solely unmarried women of all ages individuals are generally eligible. The actual applicant should have a scholar diploma in the accepted college or perhaps equivalent qualification. The abbreviation of CDSE is Combined Defense Services Exam. Combined Defense Services exam is organized by Union Public Service Commission every year for two times as CDS-I and II. # Indian Air Force Academy(IAFA). # Candidates must have finished their bachelor degree in any curriculum from any approved institution. # Candidates of last year of bachelor degree are also preferable for this exam. # There is no need of percentage for this exam. # Candidates must be unmarried male or female. # Citizenship:- Must be Indian. 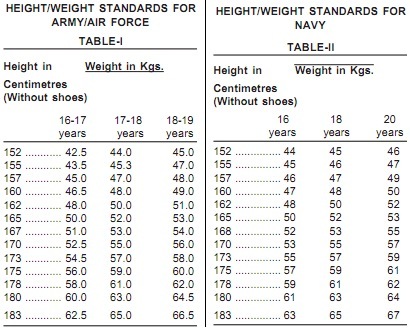 For Joining in Air Force Academy your age should be in between 19 to 23 years. selection procedure in this examination on the basis of written exam,SSB interview and Medical Test. Those appeared in the final year examination are also eligible to apply for the CDS examination. CDS stands for Combined Defence Service . UPSC Conduct CDS Examination for twice in a year in CDS I and CDS II . Indian Military Academy:- You need to be a graduate in any discipline from a recognized university. Your age should be between 19 and 24 years. Air Force Academy:- You need to have a bachelor's degree in science with physics or mathematics or you can do B.E./B.Tech in engineering or technology. Your age should be between 19 and 23 years. Naval Academy:- You need to complete your graduation in engineering or technology or you can do B.Sc degree with physics or mathematics. Officer's Training Academy:- You need to have a bachelor's degree in any discipline from a recognized university or institution. Your age should be between 19 and 25 years. I have listed some books name you should prepare well these books then definitely you will cracked the written exam. issued by the Government of India. either be married or unmarried. Age limit-19 to 24 years. OTA is for both boys and girls. IMA,AFA,NA is only for boys. English and Mathematics for IMA,AFA,NA. What are the possible requirements in attending CDS?